Several bright young engineers have been swiped up to work for Valve. Yes, that Valve, the game company. Amongst them are [Jeff Keyser] aka [Mighty ohm] and [Jeri Ellsworth], both names that we have seen on these pages many times. We’ve heard that Valve is a fun and very unique company to work for. Apparently there’s no solid hierarchy. What we, and everyone else in the universe wants to know is what they are building! There were rumors and speculation of a game console that were quickly squashed. [Michael Abrash] let out some information in an interview that he was doing R&D into wearable computing. He also points out that he was not making a product. So, let the speculation begin! We asked [Jeri] if this meant she couldn’t publish her own hacks anymore due to contractual agreements, but she said that she can still do them and has some cool stuff coming out soon. [Jeff Keyzer] has a new version of the HV Rescue Shield available. 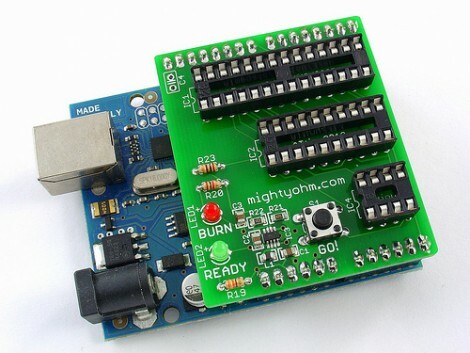 This tool allows you to use an Arduino to reset the fuse bits on AVR microcontrollers. This is necessary if you make a mistake and disable the reset pin, or choose the incorrect clock settings (this will probably happen to you at some point). In order to bring the chip back to life you’ll need to use High Voltage Programming. The last version of the shield only worked with High Voltage Parallel Programming (HVPP) but this rendition can also use High Voltage Serial Programming (HVSP) for 8-pin chips that don’t have enough inputs for parallel communications. As we talked about in our AVR Programming Tutorials this is no replacement for a high-end programmer like the STK500 or an AVR Dragon, but if you already have an Arduino a kit will only cost you $20 (or you can etch and build it yourself). We would have liked to see a breakout header for the HVP signals for off-board use. The absence of a breakout header doesn’t preclude this, but since you need the on board boost converter for the 12V signals, and because this shield can’t be used with a breadboard due to pin spacing, it’s hard to patch into signals for non-DIP use. We also think some clever firmware hacking and this could be used for HV programming, like we needed for that LED light bulb. Hobby electronics manufacturer SparkFun has started offering various classes at their Boulder, CO facility. [Landon] has been attending as many as possible and posted about his experience during their Stencil and Solder Paste class. Solder paste is used when manufacturing boards with a reflow oven. He took quite a few pictures of the process and posted notes and audio. He says it’s definitely something you’d have to learn hands-on, but his numerous photos give you an idea of what’s involved. Below, you can watch a video of the paste clean-up pass and stencil removal. Since our last post about his WiFi Streaming Radio Project, [Jeff] has been hard at work to release part 8 of the project where he adds tuning control to the radio. Interestingly enough, the addition of the tuning control only requires a potentiometer and the completed AVR LCD board from part 7. After wiring the potentiometer to the analog to digital converter on the AVR and adding a few lines of code, the radio can now be tuned quickly and easily. In addition to thoroughly explaining the hardware changes, [Jeff] details the configuration changes required to the OpenWRT framework so that bidirectional communication between the router and AVR is possible, allowing the tuner to function properly. Be sure to check out the video above to see the tuner in action. [mightyohm] put together a nice piece of lab kit. It’s a PID controlled hot plate. The plate is capable of reaching 500F, hot enough to do SMD reflow soldering. The large chunk of metal has a hole drilled through the center to contain a cartridge heater. A thermocouple is used to monitor the temperature of the plate. Ceramic standoffs separate the plate from the rest of the device, but he still needs to come up with a way to stop the radiant heating. The control box houses the surplus PID controller along with the power switch and solid state relay (SSR).